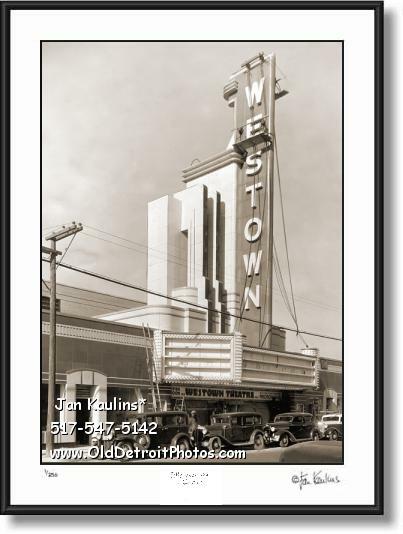 OLD DETROIT WESTOWN MOVIE THEATER black and white photo print photograph picture for sale. This beautiful sepia toned old vintge WESTOWN MOVIE THEATERE photo print is made from a restored vintage very rare black and white historical original 1936 Westown Theater photo. The Westown Theater was located at the corner of Fenkel at 15225 Wyoming. It opened in Novermber of 1936, the year that this photo was taken and was designed by noted architect Charles N. Agree. It was built in a French Moderne style with a very impressively large marquee. It closed in 1964 and has since been torn down. This is a wonderful image of that historic neighborhood theater just before it opened with workers shown putting up a sign that reads 'Westown Theater--opening soon!' There are several vintage old vehicles parked in front of the Westown Theatre seen in this vintage photo from 1936.